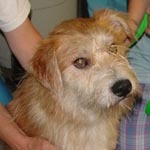 Georgie is a fluffy, long-legged Wheaton Terrier/Wirehaired Terrier Mix. He is approx. 2 yrs old. He was a KY stray who recently came to us. He is joyful, gentle, and great for any home. Mama Mia is a 3 year old Chihuahua mix who was owned by a single woman who became homeless and hospitalized. 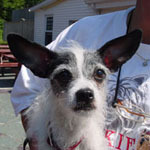 She is devoted to her adult foster mom so would do best in a home with adults. She loves to walk on a leash and to ride in the car. She went everywhere with her former owner so is used to traveling. She is spayed and up to date on vaccines. Wyatt, the remaining BC/sheltie mix, is the largest and is actually a quiet dog, very well adjusted, a good find for someone looking for a border mix. He plays nicely with all the dogs and can hold his own with small and large. He is so nice. 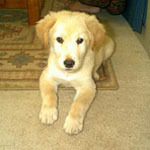 Slick is an active, smart and fiesty 9 week old retriever puppy . No children under 10 as he tends to be mouthy. Slick needs a family that will give him the discipline and extra training he needs so he can take his rightful place in the family. 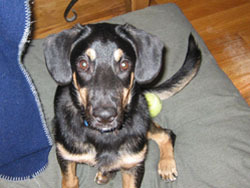 Andy is a male, 5 month old shepard mix looking for a loving forever home. He is very quiet and good in his crate, great in the house. He doesn't get into stuff, not a big chewer. He plays well with other dogs and is just an awesome puppy. He thinks he's a lap dog and loves to be held. He knows SIT and DOWN, even flies down when he sees a treat. He is a gem and will be one of our upcoming success stories if someone would just give him a chance. He's an easy keeper too for someone wanting a puppy but not all the work. He is 99% house trained too. 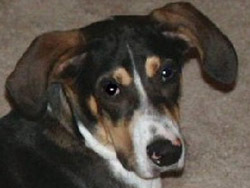 Murray is a six to nine month old tall hound mix. 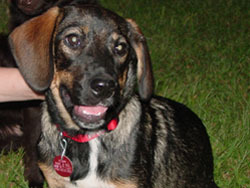 He looks to be Harrier or a tall hound mix. His coat is very shiny and healthy. His family was moving and he was dropped off at a Southern shelter. He's house-broken, playful, curious and alert and has learned the commands to "Sit" and "Stay out of the kitchen, Murray!". He's trying to become friendly with our seven cats, but they will only tolerate and ignore a puppy that wants to play tag with them. Murray is ready for a home with someone that will play tag and fetch with him (he's very good at 'fetch'.) and give him the love and security he deserves. 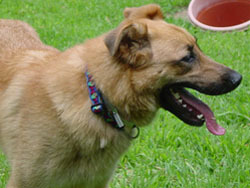 Valentine is a 3 year old female Shepherd who was rescued from a large overcrowded shelter. She was turned in by her owner's sister who said she no longer wanted the dog. She loves to chase balls and she loves squeaky toys. Great personality. She passed the temperament test and is sweet. She weighs about approx. 55 lbs. and is already spayed. 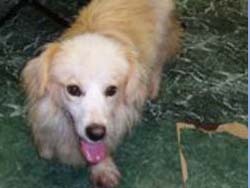 Teddy is a 3 year old male Cocker mix who was found wandering the streets of Springfield. 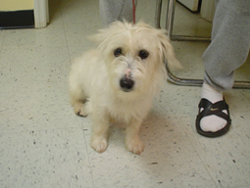 He is being neutered soon and will have surgery to remove a lump on his neck, then he can be placed for adoption. He is adorable and very devoted to people. He weighs about 20 lbs. but needs to gain a few pounds. 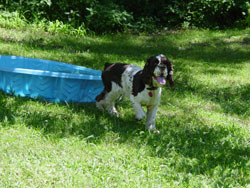 He is cocker sized, but with the markings of an English Spring Spaniel, liver and white. A stay at home or part time worker would be best as he just wants to be with you at all times. He does not play with toys, but is more of a lap dog. He is good with dogs and cats (he will follow cats around and is curious but will not engage them). 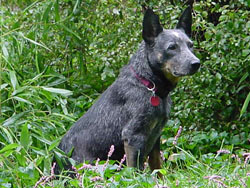 Zipper is a gorgeous Blue Heeler Cattle Dog who came to us from a WV shelter where she was very scared. She's in a foster home with lots of dogs and really starting to come out of her shell. We would love to find an adopter who knows the breed. They are a special breed and we love them, but they like to work so they need a job. 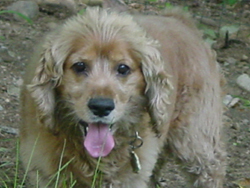 Toby is a sweet blonde cocker who came in with Roxy. They were turned in because the owner was moving. He is the biggest cocker we've seen in awhile, but very passive and obedient. He gets along with dogs, cats and kids. He's seven and has a lot of good years in him. 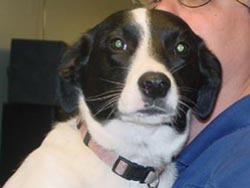 Hope is a one year old Border Collie mix who was adopted as a young pup and recently returned as she had too much energy for the family's young toddler. 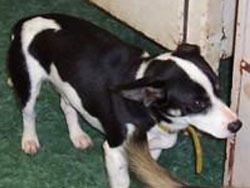 She is a wonderful dog, completely house trained, loves to play with other dogs, loves her toys. She is sweet and beautiful and deserving of a permanent home. Please be someone who can spend the rest of her life with her. Families need a fenced yard. Working folks would need a dog walker or doggy day care. She is current on vaccines, spayed, and microchipped. 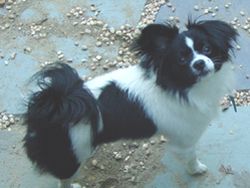 Menchie is an adorably friendly little Papillon who was abandoned at the dog sitter's. He is under 10 lbs and a bundle of joy. He's a year old and loves dogs and people. Raised with kids over 7. Matt came to a WV shelter as a stray. We are not even sure if he is corgi what ever he is hs is way to cute and gets along with other dogs. He weighs about 25 pounds. There are many dogs at this shelter just like Matt, so if he's not a match, we have more coming in. Willie will arrive on Sunday, 9/5. He gets along well with other dogs and kids but we are not sure about cats. He is up to date on all his vaccines. Babs is an adorable female golden/lab mix looking for a loving home! Do you have room in your home and your heart? This gorgeous Aust. 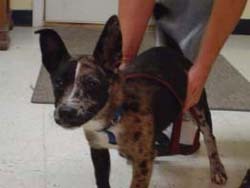 Cattle Dog pup is looking for a loving forever home. She is being assessed by her foster home, at which she just arrived, and more info will follow soon! Murphy is a long-haired dachshund mix, approx. 1 yr old and a very quiet boy. He loves to chase balls and seems to sail through the air as he pounces on them. He is looking for a loving home and will make an excellent pet. He should go to an adult home as he will nip if you pick him up wrong. He's a real little guy, under 10 lbs. 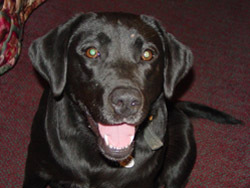 Melody a well-behaved & friendly black lab, approx 2 yrs. old. She loves riding in the car/truck and is amusing because everytime you stop, she sits! She has a spay scar. She weighs about 80 lbs. She is the stocky English breed. 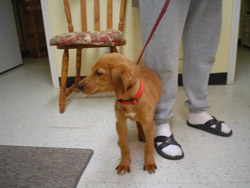 Bazooka is a male, 4 month old lab/hound mix looking for a loving home. 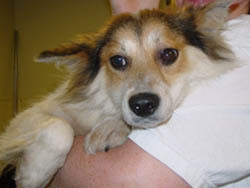 Fox is a one year old blonde, quiet corgi/sheltie mix, approx. 1-1/2 to 2 yrs old. He is under 25 lbs. 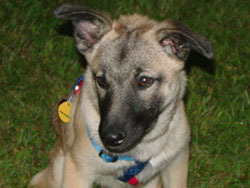 Cymbal is the sister of Tama, a puppy we placed in July 2004. Both puppies came from a southern shelter, but Cymbal had to be left behind because she had a reaction to a puppy shot (lepto) and was in a foster home until fully recovered, which she is now. 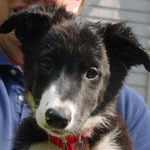 She is a gorgeous pup with an exceptional temperment, very smart, and quiet. 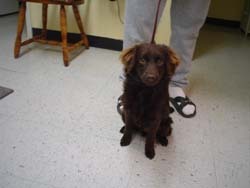 She is already spayed and ready to go to her new home.